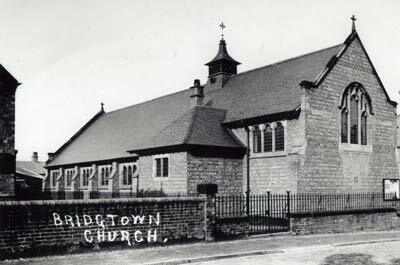 The Church of England first established a mission in Bridgtown in 1872. By 1874 they were able to open a school-church, the building being dual-purpose. Two years later a separate building was built specifically for worship. This church was built of iron but it didn’t stand the test of time. By 1899 it was replaced by a fine red brick building with stone dressings. This is the building in the main photograph. 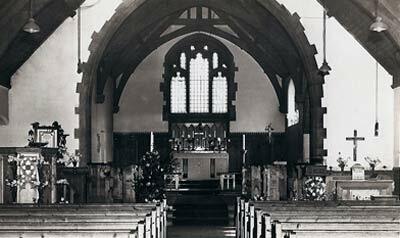 The church had nave, chancel, north porch, organ chamber and vestry. The plate included a silver chalice and plate which had been presented in memory of Sarah Jane Barnes by her husband in 1924, and a silver ciborium given by Mrs. Whitehouse in memory of her husband George in 1938. The Church School had been built on land donated by Miss Crockett of Cannock and was specifically aimed at “the poorer children of the parish”. The school started with 90 children and was given a yearly grant of coal by West Cannock Colliery Company. By 1891 the school roll had grown to a total of 131 girls and infants. By then it was in receipt of a regular parliamentary grant. In 1951 it became a Church of England (Controlled) School which meant it became part of the Staffordshire Education system. The school eventually closed in 1960. The church buildings can still be seen today in Church Street but they are now used for industrial purposes, as shown in the final picture.